they helped to make our yearly Turkey Dinner a huge success again. We served close to 600 people this year. We are very thankful for your ongoing support. 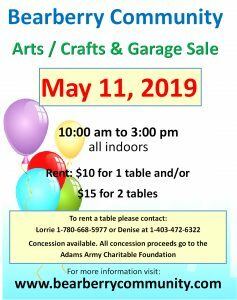 Thank you to the Sundre Greenwood Neighbourhood Place and the Mountain View County for the help in promoting our events in their monthly newsletter SUNDRE ON THE GO and in the Gazette. If you would like to be on our email list and to get more information about upcoming events, please send your Email. If you are looking for accommodation in Bearberry please have a look at our accommodation links.